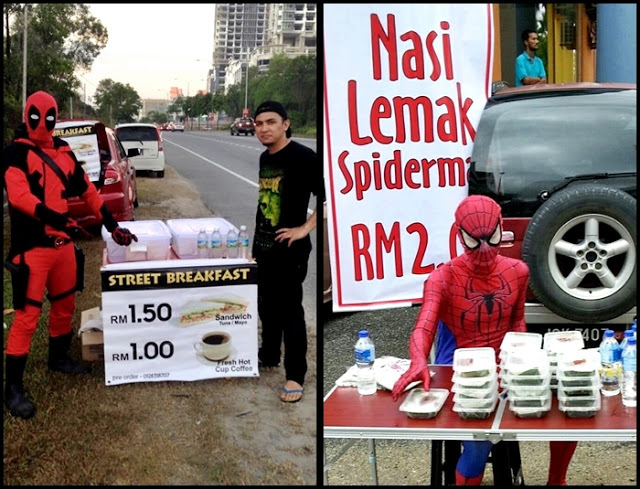 It has now become a trend for superheroes to start selling street food in Malaysia. 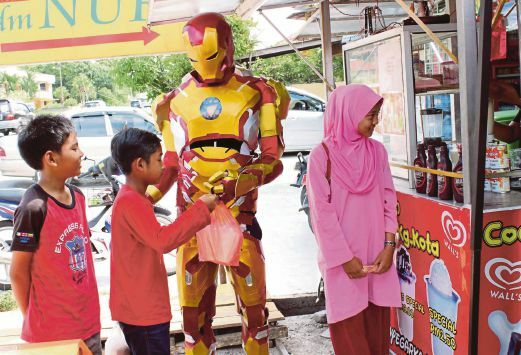 Following the footsteps of Spider-Man and Deadpool, 34-year-old Mohd Khairi Abdul Aziz too has decided to don a superhero suit and sell coconut shakes in Kelantan. Using the school holiday season as an advantage, Khairi is able to attract plenty of kids and adults to buy his shakes. Some of them would even come from a far just to take selfies with him. Other than Iron Man, Khairi said that he sometimes cosplays as other famous characters too like Batman, Kamen Rider and also characters from “Star Wars” and “Halo”, My News Hub reports. Located at Jalan Pintu Geng, Kota Bharu Kelantan, the coconut shakes are priced between RM2 and RM3.50 each. He said that his sales has increased immensely after he started cosplaying as the Marvel superhero. Khairi’s Iron Man costume cost RM1,000 and was bought from a friend in Thailand.